Sending a congratulations letter or note to someone about their accomplishments on a project lets him or her know that all that hard work has made an impact, and a positive impression on the people they work with. A well-written letter will really make this person’s day so read on for tips on how to craft a great one. You can also review two examples of congratulations letters written specifically for accomplishments at work. 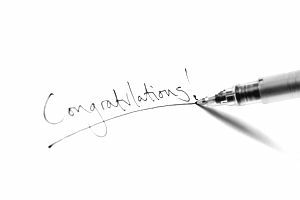 Why Write a Congratulations Letter? All too often, employees work tirelessly on a project, and when it’s complete, they just keep going on to the next with no recognition or appreciation. Although congratulating an employee isn’t mandatory it’s a good thing to do. Make it a point to mark even the small achievements with congratulations and thanks. Your employees will appreciate knowing that their accomplishments don’t go unnoticed. That feeling of being appreciated with go a long way toward work satisfaction, and happy employees are much more likely to give their best efforts. A well-written congratulations letter is a nice investment on your part. When sending a congratulations letter, you have the choice of sending it via email or postal service. Both methods have their strong points, but neither is the right or wrong way to do it. An email note is quick and conveys your feelings immediately, in the moment of accomplishment. The recipient is rewarded with instant gratification for a job well done. In addition, with an email, you can congratulate a whole team of employees at once if it was a group effort. Sending your letter through the postal service will slow it down a day or two, but can bring with it the caring, personal, and tangible expression of a handwritten note. The card or note can become a nice memento of your appreciation. Another option is to send a formal business letter of congratulations, which is appropriate for filing for later use in a portfolio or as an endorsement for employment. In this case, the congratulatory letter becomes a useful business document. If you’re going to send the congratulations by email, put “Congratulations” or “Thank You” and the title of the project in the subject line. That way your employee will be sure to open the email right away. When sending a card, you can put the date in the upper right-hand corner (if you want to include it) and your salutation on the left, followed by the body of your letter. A formal typewritten letter should follow business conventions with your address, the address of your employee, and the date on the left side. However, you choose to convey your congratulations, be absolutely certain to send it within 24 hours of the completion of the project. Waiting will diminish the impact of your sentiments. In the body of your letter, you should mention the person’s role in the project, what was accomplished, and express your congratulations on successful completion. Depending on the scope of the project, you can also mention what it will mean to the company at large, or to the department specifically. There’s no need to write a long letter or get too personal. Keep it succinct and end your letter with an appropriate closing and your name or signature. If you choose to write an email, you can set your email to add your signature automatically. Here are some examples of congratulations letters you can send to someone who has done excellent work on a project. You may find these examples useful, but be sure to tailor them to your employee’s particular situation. Congratulations on doing such a great job on developing a new project plan for your group. The extra time you've been putting in on this has really paid off, and I believe that you have presented an ambitious and attainable set of goals for your team and the company. Congratulations on the completion of the construction of the new marketing wing of XYZ. I know how much time you put into the plans for the building, and I really appreciate the innovation and attention to detail you brought to the project. We knew you were the right person for the job! Thank you so much for your and your staff’s hard work. We look forward to future projects with you.